If above is completed in less than 26 minutes, start over and continue until 26 minute cap. Joe Ciampa is March’s Athlete of the Month. 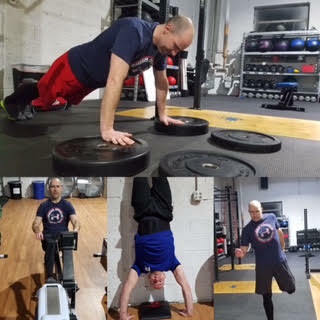 Read more about this WOD crushing, Burlington native and why we are so thrilled he is one of our chosen athletes! How did you learn about CrossFit and how did you end up in our awesome Box? My introduction to CrossFit was somewhere around 2010. My wife, Katy, is a teacher at Hopewell Valley Middle School. It was a group of her co-workers that started meeting informally at the high school gym to do some CrossFit workouts. Two to three times a week, they would meet up to run through some twisted form of exercise punishment. It was this awesome and dedicated group that was kind enough to invite me into their little fitness torture fest. From that point on, I’ve been consuming copious amounts of the Crossfit ‘punch’! From those early high school gym days, my CF path flowed through a couple stops with the longest tenure being at Crossfit Mercer. It was really the strong armed persistence of one David M. Kohler that landed me at Hyper CrossFIT! What do you like most about being a FIT member (Hyper CrossFit Athlete)? The best part of being a Hyper athlete is having the privilege of working out with the stable of thoroughbreds, the finely tuned fire breathing fitness freaks that comprise the 5:30am class. It’s a plus that they’re also halfway decent people too 😉 Ok ok, all kidding aside, Hyper has a genuinely awesome collection of members. Since I’ve joined it’s been evident that Hyper’s success is built on the foundation of sincere and authentic personalities that offer support and encouragement for everyone around them. It’s truly a unique blend of compassion and competitiveness! What is your proudest moment/biggest accomplishment since you started? Handstand walks. What are you still working on to achieve? I would love to be able to lock down a solid L-sit to Handstand on the parallettes. It will happen!! Tell us one random fact about yourself that has nothing to do with CrossFit. In 7th grade, while visiting my friend Steve in Arizona, we made a rap song called ‘Yo, This is what we do in Wickenburg’. The background beat was courtesy of the Bell Biv DeVoe song ‘Poison’. We called ourselves S&J Music Factory. Yes people…this is all legit. No…the tape no longer exists (it’s probably buried in the desert somewhere) and No…there will not be any performances at the box! What is your favorite WOD or benchmark? Well, the one I enjoy the most is King Kong. I’ve never RX’d it. Odds are pretty solid that will never happen. But it’s great because it’s short and sweet, and I love deadlifts, heavy cleans, handstand push ups, and muscle ups. If you created a WOD and named it after yourself, what would it be? “A Hurtin’ 4 Certain”- It would be an EMOM. Movements would consist of heavy deadlifts, bar muscle ups, heavy squat cleans, and rope climbs. Don’t ask me how that rep scheme would break down, but I can tell you any EMOM that had those movements would be awesome!!! What advice would you offer to someone interested, but intimidated to try CrossFit? Absolutely positively DON’T be persuaded / intimidated by the image of CrossFit portrayed in the mainstream marketing. Mainstream CrossFit marketing is completely saturated with images of superhero fitness specimens that have physiques beyond comprehension. However, this is such a small percentage of reality. The overwhelming majority of Crossfitters are just normal, everyday people. People that are doing their absolute best to manage their respective life priorities of family and finances, schooling and careers, just to make it through another day. Then they get up at the same time to do it again the very next day. Day in and day out. And somehow, through the chaos, they just want to get in a rewarding workout to keep themselves motivated, to relieve stress, and to help maintain their sanity! THIS is the CrossFit ‘reality’. THIS is who we are. So don’t be intimidated by the superhero shredded freaks that are throwing around 600 Lb tractor tires. Just come into a box and meet the REAL people that are working out. It will be a rewarding experience.